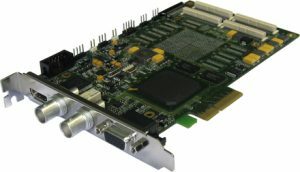 The powerful Stradis VMD-6444 Multichannel Decoder card is a 4-channel H.264/HD AVC decoder over HDMI with output resolution of up to 1080p30 per channel. It is designed to meet the needs of the digital signage market for advertising, entertainment, museum/exhibit, and hospitality applications. Stradis VMD-6444 features simultaneous H.264 hardware decoding of video clips up to HP@L4.1 with maximum bit-rate of 62.5Mbit/s. Several decoders may be installed in one PC, simplifying deployment of multi-channel HD video system and resulting in very low costs per channel. HDMI output resolutions ranging from SD to 1080p ensure full compatibility with a wide variety of video monitors, TVs and projectors. Stradis VMD-6444 synchronizes decoding across video channels and supports 32-bit graphic overlay with adjustable transparency and blending effects for a total multi-media display solution. The SDK API for Stradis VMD-6444 is based on previous generations of Vitec/Focus /Visual Circuits decoder cards to ease upgrades from Gemini and Harmony cards. SDM290ex Audio cable with 6 XLRs for 4 balanced audio outputs and 2 digital audio outputs (XLR). SDM290ex Audio cable with 4 XLRs for 4 balanced audio outputs and 2 BNCs for digital audio output. PC bracket with 2 female RCA connectors for unbalanced analog audio output. (Compatible with all SDM & HDM). Sync daisy chain cable. Connects multiple decoders in one chassis. (Compatible with all SDM & HDM). PC bracket with DB-9 connector for RS-422 machine control and BNC for LTC output. (Compatible with SDM290ex, HDM500ex and HDM850). HDM500ex Audio cable with 6 BNCs for digital audio output and 1 RCA connector forunbalanced analog audio output. HDM500ex DVI-I to VGA adapter. HDM500ex Video cable: DVI-I to DVI-D and VGA. “Y” adaptater. Internal Audio cable. Connect a decoder to PC sound card. (Compatible with all SDM & HDM). S-Video Adapter Cable: 2 male BNC connectors to 1 male 4-pin Mini DIN connector. (Compatible with all SDM). HDM500ex Video cable: DVI-D male to HDMI male (2 meter). Triple BNC to 0.10" Header Bracket (genlock, LTC). 8xAES audio out, Genlock input, SD-SDI out (split cable on DB connector). RGV/YPbPr video ou, Analog Stereo out (bracket + cable).